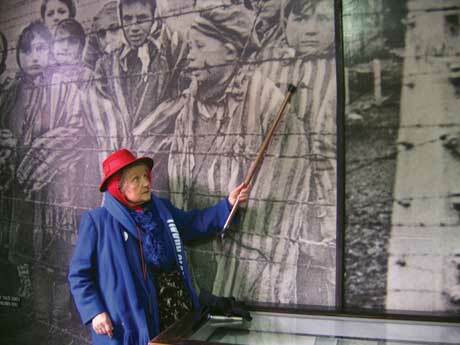 OSWIECIM, Poland – Eva Kor believes in forgiveness. Kor says she has forgiven Josef Mengele, the Nazi doctor who conducted experiments on her and her twin sister, Miriam, at the Auschwitz concentration camp. Last week, Kor led 55 American teachers and students on a trip to her former place of torment, where she was liberated exactly 65 years ago. Kor has been back to the concentration camp 13 times since 1945, many times as the leader of a tour in which she shares her memories and positive outlook. Most of those on her current trip, which was co-led by Kor’s son, Alex, heard about the trip from friends or relatives. Most are not Jewish. On the trip’s first day, Kor showed the group where she and her sister had been held with other children at Auschwitz-Birkenau. Then they visited Auschwitz I and the museum where artifacts are stored – piles of hair, eyeglasses, prostheses, brushes, and suitcases marked with the names of their owners, who thought they were going to be resettled, not murdered. “I’m still trying to wrap my head around it: I saw so much,” said Sarah Connolly, a language arts teacher from Sheffield, Pa.
Vencel is one of eight students here with teacher Jeffrey Rudkin, whose film and video class held a chili supper and auction to raise funds for the trip. The group has been posting regular video updates of the trip on its Website, btvpoland2010.ning.com. Eva and Miriam Mozes, identical twins, were born in Portz, Romania. In the spring of 1944, the twins, their parents, and two older sisters were deported to Auschwitz. The twins were among some 200 children liberated in January 1945. The rest of their family had been killed. In all, nearly 1.5 million people were murdered in Auschwitz, 90 percent of them Jews. The twins moved to Israel after the war. Eva married Michael Kor and they had two children, eventually settling in Terre Haute, Ind. Though she decided to forgive, Kor does not forget, which is why she keeps returning to Auschwitz again and again. Her forgiveness, too, has its limits. Kor’s outspoken forgiveness of Mengele, which she said she decided on in 1995 to free herself, has not been without controversy. In 2007, the World Federation of Jewish Child Survivors called it “abhorrent to forgive this monster, Josef Mengele,” and the group’s president said other Mengele twins were very upset with Kor for talking about forgiveness. “There will be no forgiveness for him, only a searing memory of how human beings should not behave toward their fellows,” the group said in a statement. Kor says withholding forgiveness locks them in victimhood. On Jan. 26, standing on the icy steps of a barracks in Auschwitz, Kor recalled seeing Russian Red Army soldiers approaching through whirling snow 65 years ago. Together with guide Bogusia Zygmunt, Kor led her group into the camp’s only remaining gas chamber, where experiments were performed before the larger gas chambers were built. In the adjoining crematorium, they lit candles and chanted the Kaddish memorial prayer. At that moment, Lincoln Ellington, 13, the youngest member of the group, had second thoughts about forgiveness.